Releases by Stephen Cracknell and his acclaimed project The Memory Band have always lent themselves to journeys and landscape: dream-like stumbles through stony megaliths, wintry climbs along snow-covered hills, drunken dashes through sun-splashed fields with a summer love. Their records have always been more pre-occupied with external narratives than internal emotions. 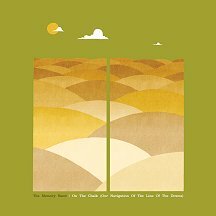 But perhaps never before quite as literally as on adventurous new album On The Chalk (Our Navigation of the Line of the Downs), a beguiling musical tribute to a mythical ancient pathway crossing a Southern England shrouded in mystery and withered by time. Made of eleven songs spread across haunting horn noises, crackles, drones, blissed-out beats and tender piano melodies, this fourth studio album marks the tenth anniversary of one the most invigorating and much loved folk acts around, a group described by NME as “a disorientating, drugged-up soundtrack for the 21st Century… genuinely beautiful.” And speaking of monumental journeys, it’s been quite a road to this moment for Cracknell and his ever evolving cast of collaborators. “I’ve had a decade of marginal poverty, nice trips and the company of wonderful dreamers,” laughs the mercurial composer, formerly seen fronting much loved outfits The Accidental and Balearic Folk Orchestra. “The idea with this record was it to be sort of a road trip along a mythical track way, an irreverent and episodic journey across a landscape inundated with history and the marks of change and transformation, some striking and immediate, others slow and imperceptible.” He may as well be describing his own sounds to be found in On The Chalk… – for every jaw-dropping shimmer of harp or arresting moment of reed organ, there’s an avalanche of clever quiet detail to be unearthed, with cinematic overtones that recall his Wicker Man touring soundtrack that Cracknell has taken to fields everywhere from Glastonbury, Green Man to a castle in Jersey. Recorded in the songwriter’s home studio in East London (“an empty schoolroom overlooking a park… quite a peaceful place for London, really”), this is an album by a group who, like their subject matter, have changed and grown over time, but remain every bit as vital as ever.